Monkeys trained to pass self-awareness test. Can we be? Imagine you grew up in the wild, in a jungle, never seeing your reflection until you were an adult. If you’ve ever been scared briefly by your own reflection in a mirror across a dark room, you might accept that even for a human, it might take a few seconds to learn to recognize yourself in a mirror. Would you do better on your first mirror encounter than these wild animals? In the story below, you’ll see that some of animals can be taught to recognize themselves. Before you read the story below, however, imagine that some intelligent aliens put you on an amusement planet which causes certain of your thoughts to manifest things, people and situations in reality, say with a random time delay. Would you be self-aware enough to “get it?” In other words, what if your entire reality is a reflection yourself, but you don’t perceive it? Perhaps intelligent aliens are as amused by us as we are by clueless animals encountering a mirror. The ability to look into a mirror and recognize oneself is a cognitive skill we all take for granted, but very few animals outside of humans are able to do it. 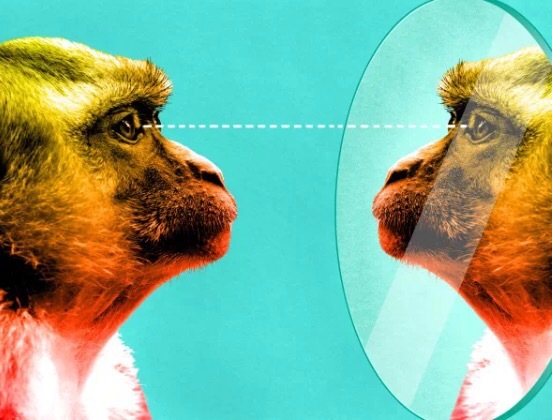 New research shows that monkeys can be trained to pass the so-called “mirror test,” suggesting that more species may be self-aware than previously thought. … In a new study published in Proceedings of the National Academy of Sciences, a research team from the Institute of Neuroscience at the Chinese Academy of Sciences claims that, with the right training, it’s possible to get rhesus monkeys to suddenly recognize themselves in a mirror—an ability that’s normally absent in this species. This suggests that monkeys possess a certain degree of bodily self-awareness, even though they lack the innate ability to spontaneously recognize themselves in a reflection. The new research also points to the inadequacy of the classic mirror test as a measure of self-awareness in certain species, and that self-awareness may be more common in animals than previously assumed. Unfortunately, we can’t be sure about non-human animals. … Back in the early 1970s, and in an effort to overcome this limitation, psychologist Gordon Gallup Jr. developed the mirror test, also known as the mirror self-recognition test (MSR), to test for self-awareness in non-human animals. Since the test was introduced, only a short list of animals have passed the MSR, including great apes, elephants, dolphins, magpies, and manta rays. Animals that fail the mirror test include cats, dogs, and even monkeys. But as the new PNAS study shows, an animal’s inability to pass the MSR doesn’t necessarily mean it lacks self-awareness. In the case of rhesus monkeys, it simply means that these primates lack the ability to identify themselves in another medium—at least not before they’re trained to do so. On their own, monkeys can’t pass the mirror test. Strangely, they’ve been observed to use mirrors to investigate their surroundings, but they can’t quite figure out who’s looking back. Leveraging their innate skill in understanding the concept of reflections, a research team led by neuroscientists Mu-ming Poo and Neng Gong placed monkeys in front of a mirror and trained them to touch a red laser pointer light spot on a board that could only be seen through the mirror. Eventually, after several weeks of training, the researchers started migrating the position of the laser light from the training board to the monkey’s face. At that point, the monkeys were able to touch the spot on the spot on their face marked by the location in the mirror—something they hadn’t been able to do prior to the training exercises. It was a kind of “a ha” moment for the monkeys. In other words, the monkeys learned, simply by looking at the mirror, that the red dot on the face looking back at them could be matched to their own. Now, this single observation isn’t enough to prove that the monkeys are self-aware (they may have been responding to the training, and not fully understanding what they were doing)—but the next part of the experiment was more revealing. After the training exercises were over, the monkeys were able to maintain their newfound skills. Unlike their untrained brethren, the trained monkeys displayed self-directed behaviors when they looked into their mirrors, such as investigating normally unseen parts of their body (dolphins, who pass the mirror test in spades, do the same thing, exploring their bodies and the inside of their mouths). These observations suggest that rhesus monkeys are self-aware, and that they’re cognitively capable of passing the mirror test—but that something is preventing them from learning this skill on their own. … Looking ahead, the researchers would like to study the monkeys further and determine which brain circuits are responsible for forging that connection. … Another possible takeaway from this study is that the mirror test is fundamentally flawed—that it’s a poor method for measuring self-awareness. For now, we’ll have to be content with the mirror test—but with the understanding that there’s more to self-awareness than a silly reflection, and that some animals may possess types of self-awareness we’ve never imagined. Can humans be taught to become self aware, at the next level?